These heavy duty, 2-inch Ratchet Straps from US Cargo Control are versatile tie down tools designed to hold loads in place on trucks, pickups, trailers, rail cars, semis, and other freight carriers. The yellow, 12,000 lb. industrial grade webbing is 30 feet long on each strap and will not stretch over time or loosen with road vibrations. As an added bonus, these tie downs have extra long and wide handles which provide a comfortable grip and extra leverage when cranking the ratchet. 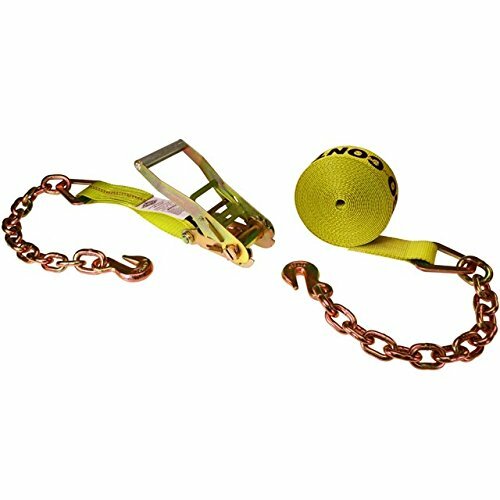 These straps have chain extension end fittings with clevis grab hooks - useful for many custom tie down assemblies. Durable polyester makes these straps highly resistant to weathering, abrasion, corrosion, and other damage. When protecting your valuable items for transit, tie down with confidence using quality, reliable ratchet straps from US Cargo Control. All of our ratchet straps are labeled with their working load limit to meet CVSA guidelines, DOT regulations, and WSTDA, CHP & North American Cargo Securement standards. The hook or end fitting is generally the weakest part of a ratchet assembly, and thus determines the assembly's work load limit. When tying down an item, make sure the total work load limit of the strap(s) you are using equals or exceeds the total weight of the item(s) you are tying down. Extra long and wide handles provide an easy grip and extra leverage when ratcheting. Chain extension end fittings with clevis grab hooks make these tie downs extremely versatile! Polyester webbing is resistant to weathering & corrosion, and has a 12,000 lbs. tensile strength.